The Mesh Smooth Normal node . Drag the Mesh Soften Edges icon into the Node Graph. Connect the output socket into the Img socket in the Mesh Soften Edge node. 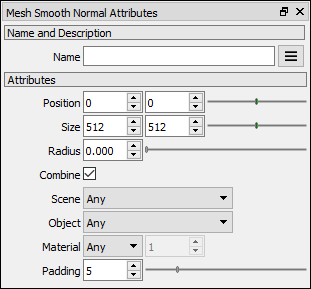 Adjust the attributes of the Mesh Soften Edge node to modify it. The Normal image with the Smoothed normals. Radius The radius of the pixel sampler. Combine If checked, the pixels sampler includes pixels from non-connected mesh surfaces. If unchecked, the pixel sampler considers only pixels that come from the same group of connected faces. This video tutorial shows how to use the new Mesh Smooth Normal node to bake a normal map that softens the hard edges of your models.